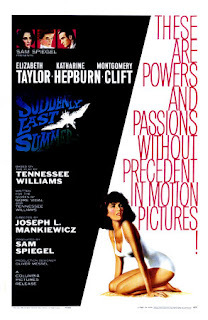 If I had to chose the one film that represented Hollywood's rebellion against the Hays Code, it would most definitely be Suddenly, Last Summer (1959). This film is as explicit as it is coy. It is in the throes of desperation - wanting to tell the viewer what it wants to say but having to hold back. The story is bursting from the seams, although it is mostly contained, some secrets find a way to ooze out the sides. After viewing this film recently for the first time, I wondered how much of the story is representative (or at least symbolic) of the fight against the Code? Take for example, Elizabeth Taylor's character, Catherine. The previous summer she had witnessed the most utterly grotesque sequence of events that culminated in the horrific death of her manipulative cousin, Sebastian. After her return from Europe, the story is held inside her tormented mind and she is consquentially punished for the danger the truth she holds represents to others. Katharine Hepburn plays Violet, Sebastian's mother, whose incestuous relationship with her son lends to her desperate need to keep Sebastian's image alive and well - one even may say "pure". Catherine threatens to tarnish the image with the tale of Sebastian's last summer in Europe and Violet wants to literally rip the story out of her brain, by means of employing Dr. Curkowicz, played by Montgomery Clift, to perform a lobotomy. Catherine is the owner of a story that needs to be told and encounters a long and difficult path to become the story's teller. When she is finally able to give birth to the story, the experience is painful, ensuiing in screams and sobs but in the end healing. Violet, the censor, the person still alive who is most threatened by this story is not capable of handling it after repressing it for so long. Does anyone see the connection? I tend not to think this was in any way on purpose but it was probably a subconscious for of rebellion. It could also be the English major in me just looking for something to analyze. Who knows? What I do know is this film is unquestionably part of Hollywood's break from the code.